The Infertility Industrial Complex: Who Will Speak Up for the Not-Yet-Born? The quote in that image is one of my favorite quotes by Martin Niemöller, about our moral obligation to speak up against injustice. 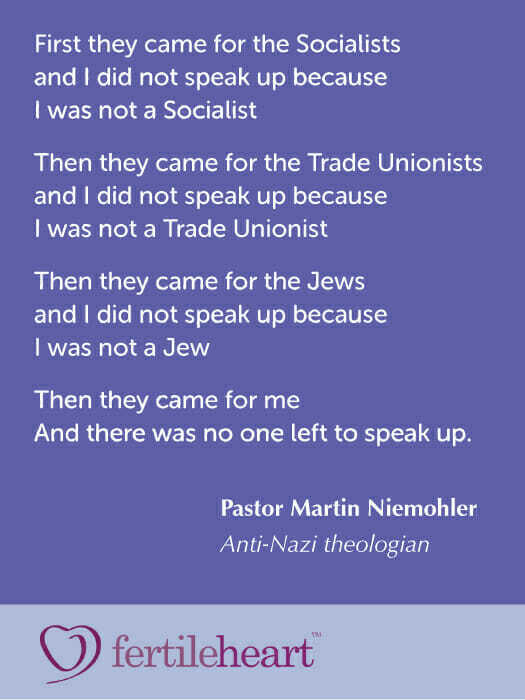 Niemoller, was a Prrotestant pastor who spoke up against the Nazi rule. Although WW 2 ended 70 years ago, the need to speak up remains as acute as it was then. It’s easy to rationalize our silence, but part of us knows better. Today all I ask is, Who Will Speak Up for the Nor Yet Born? The problem is NOT IVF or any other Assisted Reproductive Technology. There is certainly NO SHAME in using medical technology to help us achieve a dream when all else fails. No, in-vitro or ICSI or egg donation is not the problem. Some of us need such intervention. Many of us use it because we can. Some of us do need it. Many of us do not. Still, the problem is not assisted reproduction. THE FEAR OF SPEAKING AN UNPOPULAR TRUTH. that comes after we got what we wanted. Life gets busy with babies around. Once our own battle is won, it’s human to forget others are still on the battle field. I do, I really do understand that. I’ve made that mistake countless times in my life. Who Will Speak Up for The Not Yet Born? Will the infertility advocacy groups bankrolled by IVF clinics? Will the mind body therapist who tells me her children could’ve been born without technology but she was just impatient. So her salary is now paid by a large IVF clinic. And her beautiful children inspire others to walk her chosen path. Will that famous fertility acupuncturist whose majority of referrals come from IVF clinics? Who will speak up for the NOT YET BORN? Aren’t they, the babies we love more than life itself, aren’t they the most vulnerable among us? Aren’t they the ones who’ll pay the price for the well-oiled machine of the $10 billion and rising Infertility Industrial Complex? Wonderful words of strength and courage, everyone. To me this Fertile Heart work is so much about honoring women, and in doing so, honoring everyone. It is about time we all do that – even honoring ourselves (sometimes the toughest if we were not respected by our parents.) Cheers and yay to everyone! It never ceases to amaze me how whenever I check Julia’s blog there is always something that so deeply relates to what is going on for me at the time. This post is no exception. After going to Woodstock and being a part of the visionary moms circle for a while, things have changed dramatically in my life as I have recently given birth to twin girls–conceived naturally. Before the birth of my girls I thought that after their birth I would want to just walk away from the fertility world and enjoy being a part of the baby world. But, since their birth I have felt this strong pull towards the world of fertility–such that I am seeking opportunities to speak up. I think there are 3 reasons that I feel this strong pull. Firstly, I am immensely grateful to Julia and the other women I met along the way who helped me reach this moment. Secondly, I can’t and don’t want to forget the pain I went through in the process and would love to help mitigate that and help anyone still going through it in any way I can. The people who were there for me, and the other women on the phone calls, helped me so much and I deeply want to pay it forward. But thirdly, I feel this strange sense that when people meet my girls they need to know the story of how they came about, particularly that after many failed IUIs and IVFs and being told that I would need to do egg donation or adopt, I conceived twins naturally. I need people to know this since I hear all the time that people speak about IVF as a sure thing and as no big deal and after going through its hell 3 times and having it fail, I truly felt like there was no hope. Julia taught me otherwise. I need people to know that just because these interventions fail, does not necessarily mean that one cannot conceive! I know that when people hear I have twins the immediately think “oh, IVF”, and I feel called to say–no, IVF failed, but diet and emotional and spiritual healing worked. For everyone who is walking towards their babies I am sending you love and support! Thank you sooo much for taking out time and sending us your message ! Is your story published somewhere ? If not, do you mind sharing it with us? That’s amazing on so many levels, Dmana! I echo MH: Please post your story here or on the Visionary board. We would love to be even more inspired by you. So great to hear your story and I do believe we been on calls together so it is wonderful to hear from you! I think it’s great you want to speak up, especially since conceiving naturally after doing the work and using the FH tools. I agree, I think many people automatically think twins are and IVF consequence. We are not used to hearing wonderful stories of spontaneous multiples that were conceived the old-fashioned way. Not to put down ART/IVF, but we need to give credit where credit is due and I think you’d be a great leader for that! I’ve read this passage now three times. And here is what it evokes for me. When I went to Woodstock 2 years ago, there was a couple that had had traveled from Europe. He stood out in my mind, because when the day started, he was sitting diagonally across from me, with his body clenched and face pouting like a 5 year old. (He was probably closer to 50, but that’s irrelevant.) And I remember distinctly that when Julia brought up the subject of advocacy and “standing up” at lunch time, he burst into tears. I remember him saying if he and his wife were just even. “two steps ahead of where they were, he could do something more. And I remember thinking how amazing it was that they came all the way to Woodstock to help themselves and in support of their belief in FH. 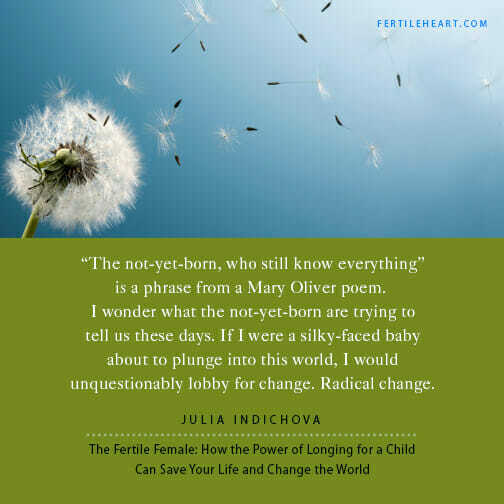 So Julia and fertile mama sisters, please accept that blog and forum posts (and it took me a while to get comfortable really starting to share my story and be honest on those), listening in on the calls, and some imagery and BT is what I can handle right now. And I will think about what more I can do going forward. At my own pace, on my own terms. So please accept me for where I’m at. I’m doing the best I can, the best I know how. And maybe soon, I will be two steps ahead of here. And I can do a little bit more. And MH, much like your promise to Julia, when I have my babies, I will make sure the world knows that FH and all of you played such an important part in my journey to birthing this baby and myself. As publicly and loudly as I can. Will use skywriting if necessary. Promise. Pinky swear. I will standup & speak up Julia ! I am in. I have promised you that after I have my children I will support Fertileheart in whatever way I can and I will do it ! Your guidance and FH tools are a life saver in various aspects of life, not just in case of baby making. This practice is making me live my life fully, which I wouldn’t have ever done had I not been challenged by GOD on fertility front and had he not shown me the way to Fertileheart. I am not ashamed of my journey. As Katy mentioned, for most part I am over Shame and Judging orphans. I am not afraid of sharing my fertility journey with anyone who openly speaks to me and if they seem to be coming from V place or with compassion. MH- I went through the same thought process when I started opening up to/pursuing tissue donation- what would people think? Would they be supportive or judgmental? I found opening up about it as a good gauge of how much people supported me. I decided that I had no shame or sense of failure or loss about any of it- it was hugely freeing to open up about it and I was excited about it. And… if they could not see the beauty of the process then that is their loss and own issues manifesting itself. Hi Heather – good to hear from you. Thnx for your perspective. In my case too, I am pretty sure my parents & in-laws & our respective siblings support us. Its just my orphan that thinks they might not take it as I see it. But on the other hand, I am really questioning myself what good it does by sharing this information? When I first went for egg sharing I wasn’t prepared & I told my father & Mother in law & both of then provided unconditional support saying once tissue is in my body & they were at loss as to why was i even tensed or anxious. So at that point I wanted support & approval from my kith & kin on my decision. This time, I am feeling exactly as you described yourself. I feel good about this move & no sense of shame,worry, regret about myself. Morgan’s words kind of repeat in my ears “I don’t see a difference between my tissue & donor’s”. Somehow this stmt is making sense now, it clearly didn’t few months back. So if this decision is not going to impact anyone & the one it impacts (me & my husband) are in sync then I am not seeing a need to even open this topic. Thanks for your response, I now feel confident & got clarity on what I think & why am I choosing not to speak about it to others – glad its not shame. I just had this conversation via one of the forums. I, myself, am tired of hiding my desire to be a mother. A single, 44 yr old mother. I shouldn’t ever feel ashamed of wanting to participate in the most beautiful experiences life has to offer. My unborn child has spoken for me by giving me strength and courage to pursue my journey. I want to let others know it’s ok for them too. Lori, you are my hero. You are inspiring me to just speak and not fear. I sometimes feel so thin-skinned, that even a raised eyebrow will derail me. But you know, why should it? Screw that. If there’s any perk to being in one’s 40s, it should be that we just stop giving a crap what others think and instead speak our truth. Lori- you are such a fierce, loving mama and one of the strongest people I know. Your willingness to be so open blows me away. I will speak up! I am re-learning to speak my truth and the shame I felt in this journey is trickling away as I continue to do my work. I never did want to share my journey b/c I did not want to hear other people’s opinions on me being 40 and working on having my first child. I did not want to hear their judgmental comments. But the TRUTH is this: I do NOT feel too old to have a child. In fact I feel quite young. So even if they did say that- it is not my truth. I know my truth now and I think my body thinks she can handle the babies in her 40s. Yes! I am holding on to my golden rope and promise to keep speaking up where I can and share the work where I can. I’m with you Katy! I am ready and willing to share my journey and speak my truth! Katy, you are my hero, too! I’m learning so much from your words. I never ever let my age be a factor in anything, until I turned 40. I then bought into every single age-related stereotype, myth, fear and opinion. I am actually in BETTER physical shape and have a much healthier lifestyle than I did at 30. The labor I went through at 39 was a piece of cake compared to the one I had at 35. I can even do a headstand in yoga–something I couldn’t even do in my 20s. Ha! But I just have a very hard time divorcing myself from that over-40 hype. I KNOW better, but I let my age orphan run the show too often. I really want to recognize and honor all that my body does and all I do to feel young, instead of fretting about the stupid number and all the myths that surround it. You guys are inspiring me! Perhaps if I speak my truth I won’t have the space or time or desire to buy into the stereotypes and ignore my reality?? Amen, sister Lori! I like that idea. As long as I have a buddy to stand by me, I’ll feel stronger. FindingFaith21 and Lori – YES to standing together! These blogs and the visionary mom calls inspire me to tap into inner resources on a deeper and more profound level. I feel incredibly connected to each an every one of you when we talk on Monday nights – you have touched my heart so deeply. And I wholeheartedly agree that I am the healthiest I have ever been! Each and every day I become healthier and stronger. This journey has lit a fire inside of me, one that I hope will never be extinguished. Katy- I agree with you so much. I struggle when I hear negative comments about age and fertility. I have said this before but I still feel that when it comes to obesity or infertility people find a way to shame those struggling with it and when it comes to age people can be so judgmental and cruel. The truth is most of us are probably in better health than we have ever been and are financially and emotionally better equipped to handle being parents. In my mind, you are never to ” old” to love someone unconditionally. I think of you everyday, especially when doing my imagery exercises. I remember reading your book and going to the workshop that same weekend. That was two years ago. I don’t think I could’ve ever made it to this point without your support and compassion. I am very, very grateful!